Sure, you’ve probably had a few martinis and Manhattans, but have you tried them with Chambord? The French black raspberry liquor recently sent over a few interesting twists on the old classics that are perfect for summer. Directions: Pour the Chambord, vodka and pineapple juice in a shaker. Add ice and shake like a tambourine. Strain into martini glass. Top with a raspberry. Or a lemon twist. As you like. Directions: Take a cocktail shaker filled with ice. Pour in Chambord, bourbon and a dash of bitters. Shake and strain into a fancy glass. Top with a fancy cherry. Voila, the Chambord is ready for the occasion. 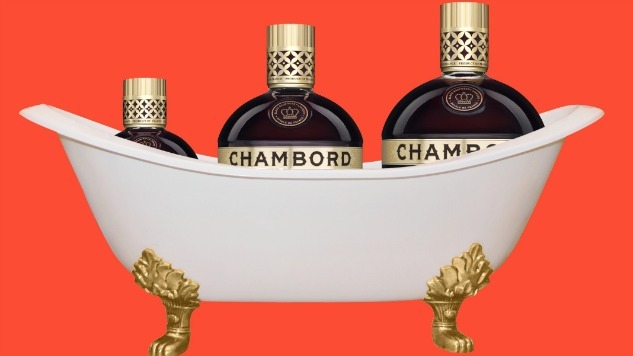 Directions: Pour Chambord into a flute glass. Top with whatever fizz your tongue desires. Then plop. Finish with the important raspberry.